Apple is launching a new Swift coding curriculum for students, along with anyone else who wants to learn the coding language. The curriculum is part of Apple’s Everyone Can Code series, and will be available for free on the iBooks Store Wednesday. It’ll also be taught in several community colleges and high schools in the United States this fall. Swift is an Apple-developed coding language for macOS, iOS, watchOS, and tvOS. The Swift coding environment is available for free, as are the related training and educational materials. Apple says six community colleges will offer its Swift curriculum this fall, and local businesses have committed to offer students mentoring and internships. Teaming up with schools to teach Swift, as well as offering free training materials to everyone is a smart move for Apple. The more people who are exposed to the language, the larger the pool of potential developers becomes. That (hopefully) translates into a wider range of compelling apps for the Mac, iPhone and iPad, and ultimately into more customers. 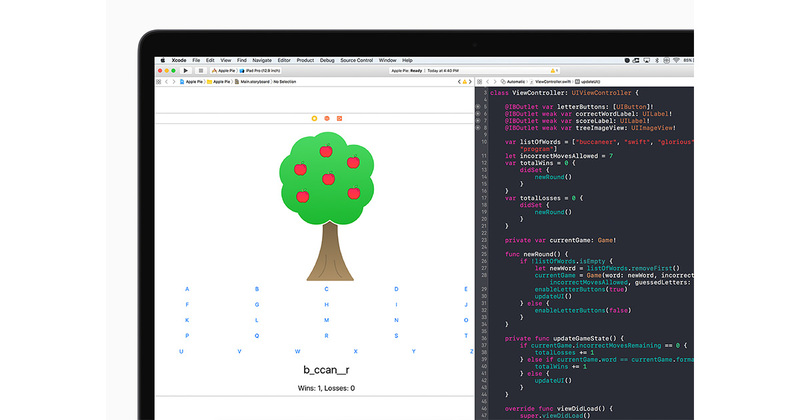 Apple’s new Swift curriculum will be available for download today, and maybe at a school near you this fall.